"Run Up North: Part 2"
This was my second year running the Charlevoix Half Marathon. This time, I shared the experience with my sister, who had never done a race before. When we'd finished, I asked if she'd consider doing another one. She smiled and said "Yeah- I think so!" Who knows? She may even be inspired to do a full marathon after this! 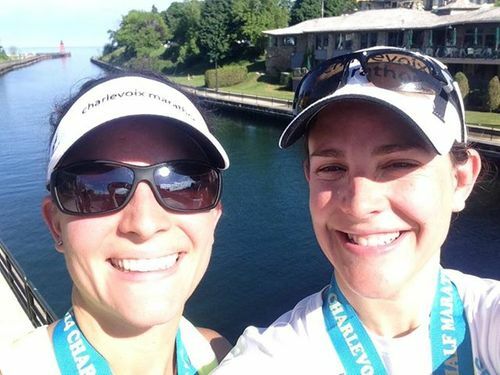 The Charlevoix Half is great because it's an easy out-and-back and is shady for a lot of the course, so no matter what weather you get, it's do-able. Lucky for us, we had a perfect day! The elevation is relatively flat, but there are a few slow-grade hills that reminded me it wasn't Chicago. My sister is from Atlanta and had trained in "real hills," so it was no problem for her. In general, I feel like this is a great race for anyone to do and, for vacationers, can offer the perfect fitness activity before a long day of laying on the dock. Parking is free until 1pm on the day of the race, so many local businesses reaped the benefits of post-race shoppers milling in and out. I'd recommend Scovie's, which is right on Bridge Street. Their cherry-chicken salad is incredible, and I don't even like mayonnaise. In short, this is a race I plan to do on an annual basis and would recommend it to anyone who might be interested in running up north! ""We're not here to cause no trouble...""
This was my second year running the Soldier Field 10-Miler and I had a great race, despite a few little issues at the beginning. My boyfriend Matt and I arrived a teensy bit after the recommended 6am time, and the parking garage was full. We were redirected to a museum garage not far from the course, but I was a little frazzled. After deciding it was a good idea to hit the port-o-potty before the race, we missed the corral by 30 seconds. In general, it's a good thing that they don't let you in after the given time, but geez, they would not budge. The challenge then became trying to navigate through people whose pace was slower than ours. I'm not a particularly fast horse, but we found it tough to pass on some of the narrow paths, thus making it a little more challenging of a race than last year. This was Matt's first experience with the race and he was impressed with the efficiency of packet pick up and the depth of the post-race festivities. It's an especially nice touch to have a serviceman or woman in uniform to give you your medal. I saw a long line of people waiting to have their photo taken with a group of them, and I thought it was really cool. Of course, running through the tunnel and out onto the field is pretty awesome too. This is a great race to kick off the summer and get back into race mode. Just be sure to make your corral! The Chicago Marathon was my first marathon and, I gotta tell you, I can't imagine a race being much better than this one. It's so well organized, the swag is great, and people cheer you on the whole time. People who had run it before warned me that the crowd might thin out a lot between miles 20-24, but I felt like there were people cheering the whole time. Running through the diverse neighborhoods really kept me going. There were plenty of aid stations and I felt that the start/end of the race were very well conceived. A note of advice that was given to me: pee before you go to the corral and then try not to stop until you're well into the race. Lots of people had to go right off the bat and there aren't many options until after Lincoln Park. Also, with the massive number of spectators and runners, it's easy to miss your peeps. Have your friends and family tell you what side of the street they'll be on so you don't miss them. Overall, I thought this race was incredible and I look forward to doing it again with a Charity team this year! The Charlevoix Marathon/Half Marathon/10K and 5K race is a nice little race to start off your race season. If you spend time Up North, this race will give any runner an early summer goal. The fact that it offers four different distances makes it a great event for families or groups with different goals or ability levels. The scenery on the full marathon is significantly better than that of the half marathon course because the half course loop goes through town and just barely makes it to the water before heading back. The full marathon course runs along the shore and offers gorgeous views of one of the most beautiful lakes in North America. Also, the swag is great. If you run the half or the full, you get a sweet hat that says "Charlevoix Marathon" which helped motivate me to train for the full (otherwise I would've felt like a fraud wearing it!). Runners for all distances get a pretty sweet shirt, although it is cotton. I love wearing it, so I can't complain. The weather in CVX is usually dry and cool, so if you're looking for an approachable and enjoyable race, this is it! 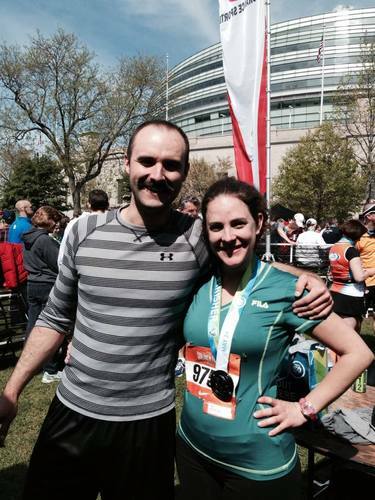 The Soldier Field 10-Miler is a darn good race. I think it's the perfect distance to start off the running season, and it's super-well organized so you don't have to worry about waiting in line for hours at packet pickup or searching forever to find a place to park. It's really exciting to run into the stadium at the end, and everyone loves to see him or herself on the jumbotron right? Nothing helps you burn out the last turn like running into the final tunnel and onto the field- like a boss! I would recommend this race to anyone thinking about getting into running because it's a nice pre-half-marathon distance and it's professionally done. Last year, the female shirts were too boxy and short, but methinks they will have something better this year. I hope so, since I'm already signed up!